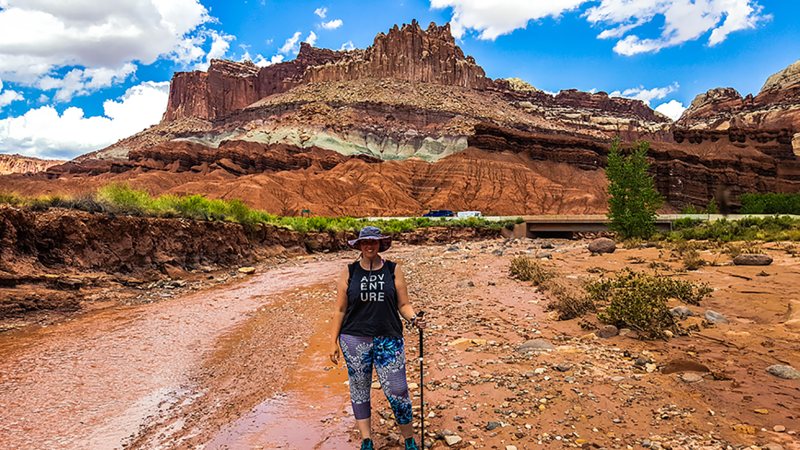 Hiking Sulphur Creek in Capitol Reef National Park - A Can't-Miss Hike! Hike 25 of my 52 Hike Challenge was a day full of firsts. This experience was unlike anything I had ever done before, and I can’t wait to revisit Capitol Reef National Park. Capitol Reef was, admittedly, just somewhere I wanted to go to check off all of Utah’s “Mighty 5” National Parks. In the end, it turned out to be my favorite of the five! Although I expect someday Zion will eclipse Capitol Reef, for now CRNP is king. The park’s main attraction is the waterpocket fold, a “wrinkle” in the earth over a fault line. The park’s name is a combination of Capitol for the white, dome-shaped rocks that mimic capitol domes and Reef for the barriers to travel like a coral reef. Some cliffs even look just like underwater reefs, but in the high desert! I knew we would have limited time at the park (half day), so I had done a ton of research into finding just the right scenic drives and the perfect hike. I turned to one of my favorite National Parks hiking resources, Dirt in my Shoes. She had written a piece about a “secret” hike, which really just means the hike is technically in the backcountry (but you don’t need a permit). In reality this trail is well-known and the Rangers at the Visitor’s Center have lots of info to share. The trail is what basically amounts to Sulphur Creek. The full point to point hike is about 6 miles long and hops down three waterfalls, but for a shorter version you can hike in reverse up to the first fall and back. With limited time we opted for the shorter, reverse option. I gotta say, even though there wasn’t rain forecast for our time in the park, stories of flash floods in this area had scared the pants off of me and I was hyper aware of any clouds over head. This part of the park can sustain very dangerous flash floods as you can see here. Luckily we didn’t get a drop of rain and my concerns shifted to heat rather than rain as we trudged around in this crazy environment (always, always, always carry plenty of water – check park resources for guidelines, suggestions and water sources). The hike starts just behind the Visitor’s Center by walking down a short path into Sulphur Creek. We were in the desert, in the sun, in August. It was dang hot, but the water was the perfect temperature to cool us down right away. By the way, if you plan to hike this trail, prepare to get wet. We wore water shoes and swimsuits and SUNSCREEN. Testing out the GoPro remote by scrambling up some rocks and taking a selfie! The hike is as simple as following the creek until you reach the first fall. It was slow going since we weren’t used to walking in (or sometimes sinking in) this type of “muck”. I took a hiking pole that ended up being helpful to pull myself out of the mud a few times, and to pick my way across the rocky bottom of the creek that is impossible to see with so much sediment in the water. It was also slow going simply because the scenery on this hike is almost unbelievable. I had to make a lot of photo stops, or sometimes I just ended up standing and staring up the canyon walls. I love to look for wildlife when I hike, and unfortunately in the desert you don’t see too much. That afternoon the best I did was find half of a pelvis and some deer tracks. Better than nothing I guess. It was fun, but sometimes difficult to walk in the water, so I’m staying on the bank for a bit. However this mud was slippery and hot so I was back in the water soon after! Have you ever been hiking in a bikini? When you reach the first fall, you’ll know it. The creek opens up into a big pool that was about shoulder deep on Eric. The mucky water didn’t look too inviting, so I stayed on the bank while Eric took a little dip. When he was finished, we started to retrace our steps. Since it was such slow going in the water, we decided to look for a shortcut. Turns out this was pretty easy, but it required climbing out of the creek bed and into scorching hot desert terrain. We decided we’d take the tradeoff of heat for time and scurried back to our starting point. I’m infatuated with Olukai shoes. Once this hike was finished I changed from my Olukai water shoes to my Olukai flip flops! We returned to our car exhausted from the heat and exhilarated from the adventure. This mini-hike (about 3 miles round trip) was a great taste of the full version and I hope to get back and hike the whole 6 mile route someday. I loved hiking through the desert and in the creek bed. It created a new challenge and provided an opportunity to learn some new skills. Have you hiked in or visited Capitol Reef National Park? Did you love it as much as I did? Tell me about it in the comments!